Regular readers will know that earlier this week this blog attended the funeral of Sinn Féin Councillor Paddy Wright in Athy. A friend of his Frank Corr wrote a wonderful appreciation of Paddy which he emailed to me a few days ago. This blog would like to share it with you. In the early hours of Friday the 7th of January Paddy Wright, Urban Councillor for thirty one years, Kildare County Councillor for five, and Sinn Fein activist for over 50 years, died suddenly at the age of 72. The town of Athy chilled with disbelief as word of Paddy Wrights death seeped into its early morning consciousness. Paddy Wright dead! Those words somehow felt counterintuitive. Had not everybody just seen him only yesterday or the day before in his usual vigorous fettle, bursting with bonhomie? They probably did. Paddy was as much a part of the fabric of Athy as its Town Hall, Squares or the Barrow River that flows through it. The rolling gait – the product of botched hip operations - the carefully positioned newspaper, the wave and shout across the street at passers-by or just sitting in his ‘constituency office’ by the window in Bradbury’s restaurant, Paddy was one of those reassuring constants that gave a sense of permanence to our town. I was in London’s Camden Town and coincidently passing near the famous ‘Working Men’s College’ when I got the call. It was at this institute that the young Paddy, who had left school at 13, attended evening classes on history and politics in his quest for an education. It must have been an excellent college because Paddy’s remarkable grasp of Irish history went beyond the great national figures or landmarks events down to the very core of the ordinary people’s condition over the last two centuries. Like many provincial towns, the Athy he was born into was a bustling centre of many trades. It was then making its first tentative steps to stretch beyond its core, but a large number of its inhabitants still lived over the shop or in the little homes that huddled up behind its main streets. The horse and cart was still just about holding its own. Country people came in and ‘dealt’ in the many pub/groceries, and there was an apparent permanence to the cast of familiars who acted out their daily routines in the theatre of its street and markets. Reared in the heart of all this, in the Town Hall where his father was caretaker, the flame haired youth quickly established himself as a town character. Raucous, combative and notable strong, he developed into a superb athlete, pounding out the miles along the banks of the Barrow as a daily routine. He played Gaelic, first with Athy and then Castlemitchel, the club he would ever be associated with, gaining a place on the county team while still in his teens and playing in the 1957 senior league final. Joining the republican movement at an early age added to his mystique. He was on the town most Saturday nights with his friend, and fellow Castlemitchel and Kildare county player, Mossy Reilly selling the United Irishman. He attended many of the protest meetings of the fifties and sixties as well as engaging in other complementary functions. A period of emigration followed when he worked in Birmingham, London (where he attended the above mentioned college) and in Scotland erecting electrical pylons. Back in Athy, Paddy worked on various building sites as a steel fixer, including the iconic Dominican Church, until eventually becoming the town’s last official grave digger. 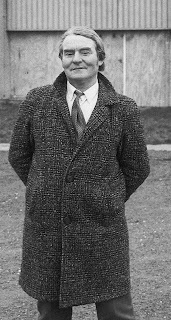 In the mid seventies he led a successful campaign to get Mossy Riley elected as the first Sinn Fein member of the urban council since the twenties. At the time Mossy was an absentee from the town and the slogan used was “Put him in to get him back”. In the event Mossy did not take his seat and Paddy ran successfully in the 1979 Local elections. After the most recent local elections Paddy was very proud of the fact that he stormed in without the use of posters and that his total election expenses amounted to 67 cents per vote garnered. I had to remind him that during the ‘79 election he actually sold his election literature at 10p a leaflet which must be unique in politics anywhere. If Paddy was good at national history, his knowledge of the history of Athy and its people was truly phenomenal. It encompassed all the seed and breed varieties down to the chemical constitution of the dirt beneath our fingernails. He understood the make-up of our town, the bitter schisms that existed after the First World War between the Kaki faction and republicans, whom the former considered traitors. He acknowledged these influences in his own family having had two grand uncles who had enlisted and also spoke of a grand aunt who would sing with gusto the Queen of the Sweet Shruleen. The queen in question was Queen Victoria. The town eventually healed, probably because of shared poverty. Paddy, however was nurtured on republican influences and able to garner votes from all quarters, but most gratifyingly, and to use one of his favourite phrases, “ironical and paradoxical” that his most ardent support came from the same areas and families whose forbearers had fought for the imperial cause. I once asked Paddy how he had such a clear memory of events that happened before he was born, he told me that when he was young he had listened intently to old people and made their memories his memories and since he had a “photogenic memory” the events of the past was safely under his cap. The photographic memory was quite evident, but the idea that this impulsive and spontaneous character ever listened or took advice from anyone was harder to swallow. During the local elections last year his election address consisted of rather long letter. One evening a hand written copy of it was shoved through my letter box with an urgent request that I review it and give my opinion on it. Paddy wrote as he spoke, in torrents, and in truth, I thought it too long and rambling. I set about modifying it and wondered how I could tactfully suggest the changes. I needn’t have flattered myself. Next morning bright and early I got a call from him; what did I think of the letter? Before I had a chance to say ‘well’, he continued “I got 3000 printed yesterday”. What could I say? “It’s brilliant Paddy”. “Good”, he replied. “I’m glad you liked it. Your opinion is very important to me”. Yeah right! Go on you ould scoundrel you. Strangely, enough people later quoted some particular bits of the letter that had a special resonance with their own circumstance or feelings. I ask you, who reads election literature? Yet somehow Paddy had the happy knack of touching people’s sentiments, while other’s literature touched inside of litter bins. Everybody in Athy has a Paddy Wright story. My own favourite is about the short strike he led during the building of the Dominican Church when the lovely ladies who frequented the old Dublin Bar took time from out their profession to chant ‘communist’ at him for picketing consecrated ground. It has a delicious twist to it but not for this obituary. He loved the pubs and spread his custom wide but bemoaned the “decline of public bar repartee” by which he meant slagging, an art at which, I know to my own cost, he was a master. He was quick witted and could be devastatingly acerbic. A councillor who was over effusive in apologising for missing some meeting or other was told in his most facetious tone “It might console you to know that you were not conspicuous by your absence. But then you’re never very conspicuous by your presence either”. Like other politicians, Paddy loved popularity but totally eschewed any effort to court it. No matter how ill favoured his views might be he would remain steadfast by them. He also had a way of disarming even hostile meetings. A few years ago he attended an IFA sponsored meeting on transport issues. There was several hundred in attendance and when contributions were asked from the floor Paddy popped up. He began by reminding them of his past distaste for the IFA even though he himself had been born on a farm. The radio mike he was using suddenly went dead. “Have you cut me off” he demanded. The apologetic operator assured him it was only a glitch and the sound was restored. “Well it wouldn’t have been the first time I was cut off you know…..Section 31”. The house came down. He was also capable of the most profound insights into the human condition. Once during the hunger strikes someone spoke to him about the great sacrifices the strikers were making dying for Ireland. I expected him to go into a rant, which he was fully capable of. But he just raised a silencing finger and simply said “No!” “No, they are not dying for Ireland; they have reached the highest state of comradeship possible. They are dying for each other”. Apart from his family, Paddy had three passions in his life, Athy Town, football and Sinn Fein, and remained constant to them all. He was a true Sinn Feiner, he believed in service to the people. He would be out in the early hours checking on paths and potholes or anti social dumping. He was a constant warrior for the social needs of the poor and disadvantaged. Something that epitomised this commitment happened early last year. The council had reneged on its promise to remove grit from the footpaths which was causing great difficulties for older people after last winters snows. But, while others slept, this seventy one year old man went out on a Sunday morning, with brush and shovel, to ensure that his promise to his elderly neighbours was kept. Paddy is survived by his sister Annie, brothers Noel, John and Brendan. May god be good to his valiant soul. Ps. an interview with paddy after the 2009 local election can be seen on 'Youtube'. Type in ‘Councillor Paddy Wright’. Thank you Gerry, for the very well done remarks by Francis Corr. Outside of you commets this was one good read. When they say "the likes of him you will never see again" they were surly talking about Councillor Paddy Wright. Codladh sámh Paddy, RIP. 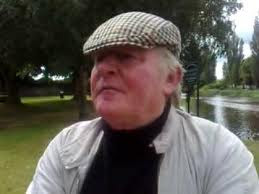 Thanks for posting the appreciation of councillor Paddy Wright written by my close friend Frank Corr it was exceptionally well written from experiences with the late Paddy also a close friend of mine again well done on publishing it as he was a very special person in the town of Athy as Frank says everyone in Athy had a Paddy Wright Story.